A spectacular high altitude plateau, cliffs, gorges, heathlands, cloud forests and grasslands in this outstanding National Park. A thrilling diversity of geology, flora and fauna. 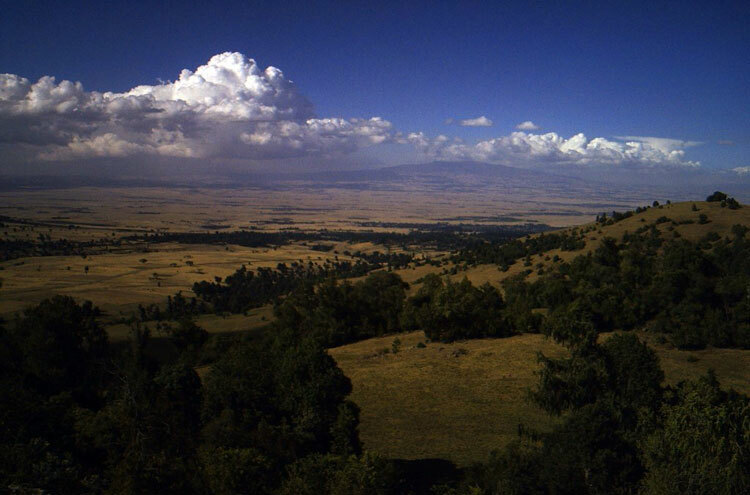 The Bale Mountains are extraordinarily interesting, and extraordinarily varied. Spectacular volcanic towers, babbling mountain brooks and serene alpine lakes; the mountains (actually escarpment) looming majestically high above, the famous high Sanetti Plateau edged by the vast cliffs of the Harenna Escarpment and fascinating vegetation and rich animal life, the Bale Mountains offer unbelievable diversity in what is really quite a small area. 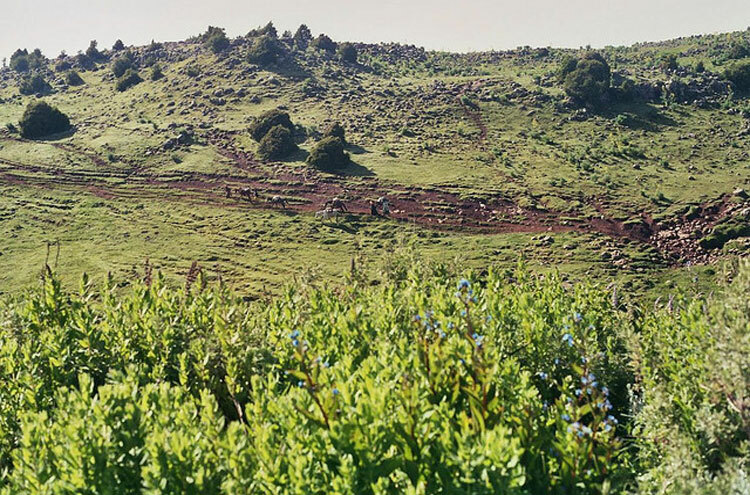 The Bale Mountains are vulcanism galore, with a huge variety of formations – consisting of ancient trachytes, basalts, agglomerates and tuffs, for the geologists amongst us. The central peaks, covered by a capping of more recent magma flows, form spectacular rock ripples and pillars, and provide a constant and dramatic backdrop to any plateau trek. One of the area’s fascinations is its very distinct eco-regions. Below the mountains to the north, but still within the National Park, are the Gaysay Grasslands and Park HQ “reserve”. The Grasslands are a wide area of low shrub and grass, with rivers and pools of varying seasonal sizes and bush and woodlands on the hillsides above. Much of the year, they are verdant and full of animal and bird life, and a wander through them is a delight; but, in dry season, it is grey and empty. The enclosure (actually a small reserve) by the Park HQ is a delight at any time of year, with beautiful open woodland and a wealth of sightings of its un-shy wildlife. Most people approach the mountains from the north, climbing through its different vegetation zones: forest (some of it state planted), then a band of lovely vivid green heather, before tipping over the lip of the central Sanetti Plateau into a new world of wide plains and gentle slopes punctuated by rocky bands and outcrops and some peculiar cliffs and towers, dominated by the mass of Tullu Deemtu (4,377m). This is a grey world dominated by low low silvery helichrysum shrubs dotted with heather of different sizes and some fine giant lobelias. If the cloud is down, it is inexpressibly lonely. 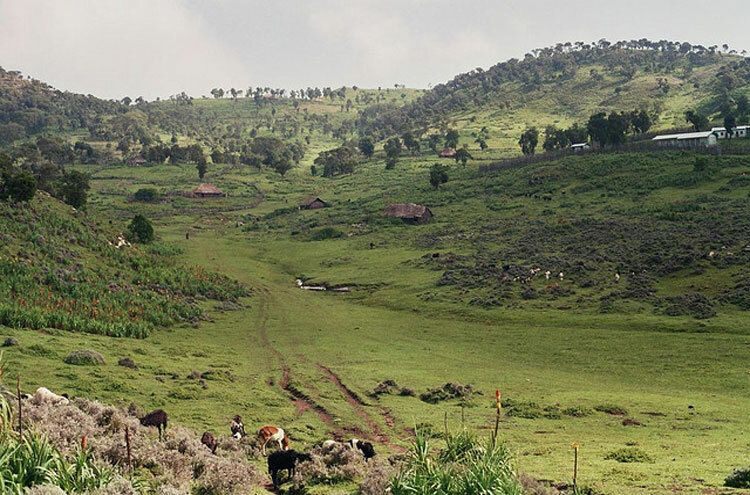 The plateau’s south is cut off by the vast cliffs of the Harenna Escarpment; below it you drop through heather, then mossy giant heather, then farmland and villages before getting to the southern Harenna Forest, Ethiopia's second-largest tract of surviving forest, a rich, damp cloud forest, its trees dripping moss and ferns at higher levels. Further in it is so remote that new species still get discovered. Even in the accessible areas the jungle is lovely and fascinating, and you have a good chance of seeing colobus and Bale monkeys, giant forest hogs and a vast selection of birds both beautiful and rare. The mountains, and the National Park in particular, are famous for their thrilling diversity of wildlife, with around 60 species of mammal, and over 260 varieties of bird. Mammals include the majority of the remaining Ethiopian wolves, and other Ethiopian endemic mammals, the Mountain Nyala and Semien Fox. 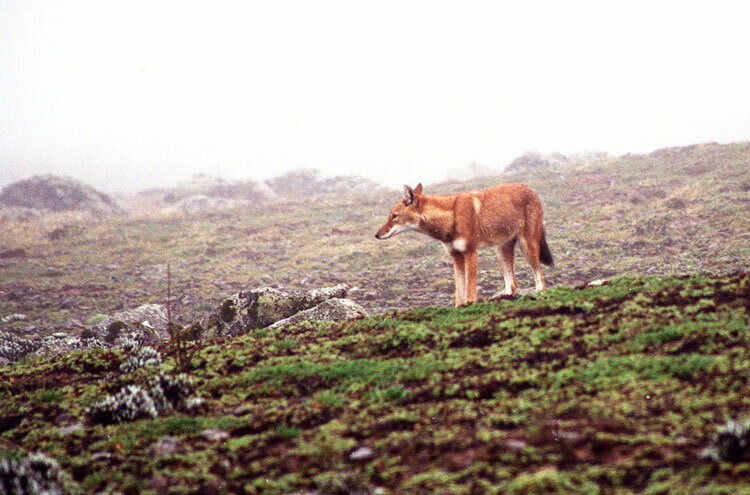 The chances of a wolf sighting on the high plateau are high, despite their being highly endangered. 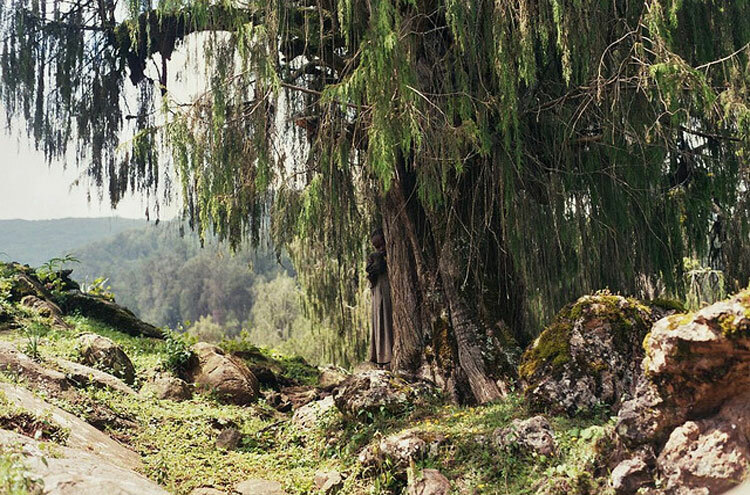 They are spectacular and gorgeous, and seeing one will be a highlight of any time in Ethiopia. You will see raptors including augur buzzards and, not unconnected, lots of mice and mole rats. Endless other birds and different animals – colobus and Bale monkeys in the Herenna Forest. Likewise lovely vegetation and birds, nyala and buck in the Gaysay Grasslands and Park HQ reserve. While this is sensational landscape, it is not pristine, grazed for chunks of the year when lower reaches are droughted-out. Even much the Harenna Forest is carpeted with cropped grass below the shrubs, with the effect that you can see some way at ground level but perhaps a few metres at head height. The main base villages (all in the north) are Dinsho, near the National Park HQ, and Dodola and Adaba on the main road in from the west. They all have accommodation of varying qualities and supplies, and are good bases for day walks or for starting a trek onto the plateau. In addition, community-led organizations provide local guides with real insight; recommended (indeed required) for most (if not all) walks. Up inside the range (mainly above Dodola) are some lodges and tented camps: you must forge through dense forest and past beautiful waterfalls, plus not a little wildlife, to reach them. Otherwise, it is camping once up in the mountains. It is delving deeper into the park, however, that yields the greatest reward. Gaysay Grasslands and Park HQ “compound” (see above for details). Gaysay Hill (named for the river) to Boditi Summit(3,520m); grand views of the Gaysay river flats and south into the park. Day walk from Dinsho to Gasuray Peak(3,325m), along the steep Web Valley and through beautiful, fragrant forest. Then follow the connecting spur to Adelay Ridge, finally descending from the northeast corner of Adelay to reach the main road back to the village. Harenna Forest: Get here if you can for lovely walking in damp, rich forest. From Dodola and Adaba: Dodola, a small town with a few lodges, sits on the main access road on the western side of the mountains. 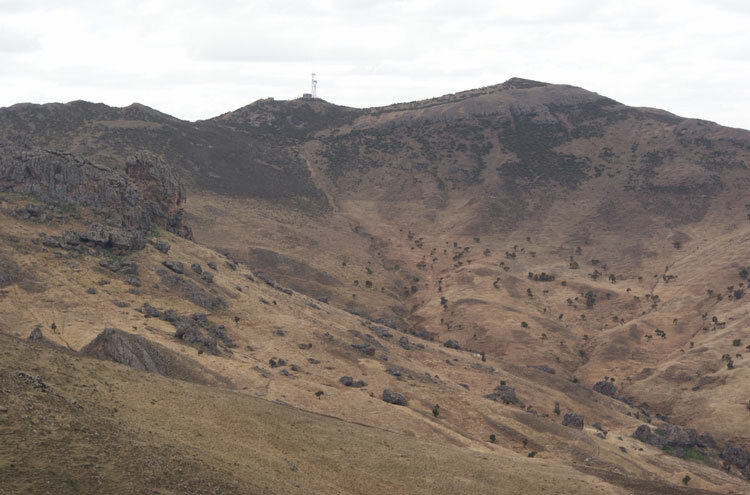 There are wonderful treks in the rugged mountains above (some argue even better landscape than in the NP, although the wildlife is less abundant); this is tough and high waking, though, so you will want to be fit, or take a horse. You can make day walks above Dodola, but the multi-dayers into the heart of this tremendous landscape are compulsory for the serious trekker. There is an outstanding lodge-to-lodge circuit. You can also head onward onto the Sanetti Plateau. See our Dodola page for more. You can also make walks from Adaba, east of Dodola. 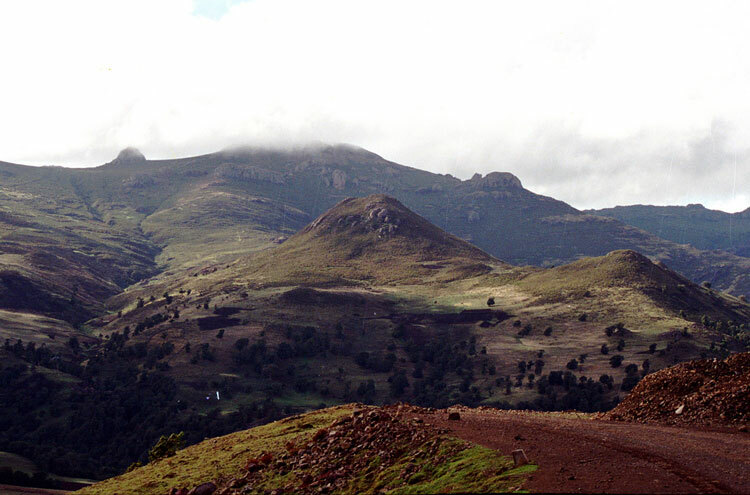 Routes exploring deep into the Bale Mountains National Park and climbing the range itself mostly begin from Dinsho, the park headquarters, or from Dodola (see above). You can make a variety of climbs to and across the plateau (make sure time is allowed to acclimatise). Trails are so many, varied and interconnected that it is vital to use a guide, not least in order to select the best option for your interests/time/fitness. Ensure you make known your desires and confirm price beforehand. A splendid shorter (3 day, or 2 day if time is short) walk on the northern mid-slopes heads up the superb Web Valley from Dinsho, taking in a fine waterfall, to reach the Sodota campsite in approaching 6 hrs. Day 2 explores the Kotera Plain, a wolf habitat, then descends to the campsite at Adeley (approaching 8 hrs) - or, indeed you could return to Dinsho if time is short. On day 3, you drop right back down and explore the very different Gaysay Grassland, for superb wildlife in the damper seasons (of less interest at the end of the dry season). Day 1: head up to Sodota Camp on the first day of the shorter walk above. Day 2: carry on climbing south-westward (obliquely to the heart of the mountains) up the stunning Web Valley to the higher campsite at Kerensa. Approaching 6 hrs. - head south to the edge of the amazing sourtherly Harenna Esarpment, then turn west to circle below 3,843m Morobawa to the Morobawa campsite. Thence on days 4 and 5 back to Sodota and Dinsho. A less demanding trek, reaching a more doable altitude, but not getting the full bleakness of the high Sanetti Plateau. - swing east across high ground, through rocky volcanic drama, to Rafu campsite in circa 5 hrs. Day 4: cross the heart of the Sanetti Plateau, eastward at well over 4,000m, before dropping to camp at Garba Guracha: likely to be a tough 6 hr day at this altitude. Revel in the beauty of the eponymous lake. Alternatively, meet the road and drop south towards the lower Harenna Forest. Day 5: having had a go at acclimatising, an optional return to the highest plateau to climb 4,377m Tullu Deemtu, the Bale's highest peak, in getting on for 7 hrs: not that thrilling a climb, as peaks go, and likely to be an at times miserable experience at this altitude, but a peak bagged for those who mind about such things. Otherwise, head north-east for home, crossing the plateau side (possibly climbing 4,203m Mt Batu if feeling up to it) to camp at Worgona, east of My Worgona and between the Shaya and Denka valleys. A shortish day (5hrs) if you don't climb Batu, so you may want to explore en route. Day 6/7: descend down the lovely Denka valley to return to Dinsho in 5-6 hrs. If time is short or you want less high plateau time, you could meet a vehicle on the road on day 4, or day 5 morning. The altitudes, on the plateau at least, will affect walkers, as, unless you approach it slowly (hard unless you are on a long trek), you will be unprepared for the altitude at over 4,000m. Walkopedia found itself panting after a short climb. But, the good thing is that you will be likely to be sleeping a lot lower, so the chance of more than exhaustion and a headache are reasonably low. But come prepared to cope. We did part of this walk on horseback in May 2015, I feel a bit of a fraud writing about it on Walkopedia, but I hope our comments may be of some interest to genuine walkers. We started a the Bale Nation Park Headquarters at Dinsho where we camped in a campsite with spectacular views over the valley below. In the morning we took a guided walk through the forest led by a very knowledgeable local park guide where we saw Mountain Nyala, Meneliks bush buck and a lot of warthogs. We then met up with our horses at the Park headquarters. The horses were small and thin, but strong and tough. They carried us up to 4,000 mts without difficulty. We were a large party with 10 riding horses for the 8 guests and 2 guides, plus about 10 pack hoses to carry the camping equipment plus 16 cooks, helpers etc who walked the whole way. We started up a well established track through many isolated small farms consisting of a thatched mud walled house and two or three acres of land being ploughed with a pair of oxen pulling a single furrow plough. We were soon above the tree line and the hill sides were covered with Kniphophia plants (Red hot Pokers) a few of which were coming into flower. As we got higher,the farms stopped and the track disappeared, to be replaced by a few herds of sheep and goats. Eventually above 3,500 mts, there were only a lot of rodents living in holes in the ground, a few Ethiopian Wolves living off the rodents, some Ibis birds and other smaller birds. We camped on three Park campsites, where we were the only campers. The facilities were very limited, an Open A Frame shelter and a long drop toilet. The scenery and the views were spectacular. There were a few wild flowers in flower. At the Highest Elevations we saw many Giant Lobelias and no other humans. The only motor vehicles we saw on the whole ride were two young men on motorcycles on the first day. I would not describe the route as difficult walking. There were a few places especially on the way down at the end where we had to get off the horses and walk, but though it was difficult for horses, it was not too difficult for a human on foot. After 4 days, we got back to the highway at Robe where we drove for 3 hours to the Bale Mountain Lodge in the Southern part of the Bale Mountain Park, driving over the Sanetti Plateau which is at an altitude of 4,000 mts plus. Again the scenery is spectacular. 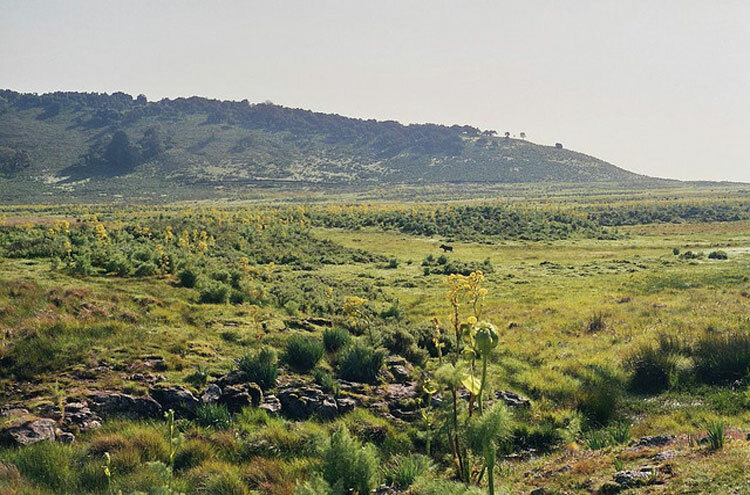 You see a lot of Giant Groundsel and a few Ethiopian wolves. At the southern end of the Sanetti Plateau the road descends the Herenna escarpment where you get spectacular views and where we saw a surprisingly overturned Caterpillar bulldozer and a little further on a big 360 degree JCB digger that had fallen off a low loader. At the bottom of the Herenna escarpment there is a beautiful rain forest that extends all the way to Kenya. We stayed two days at the Bale Mountain Lodge which opened in January 2014. It was built by a retired British Army officer who had been part of an African Peace keeping force. 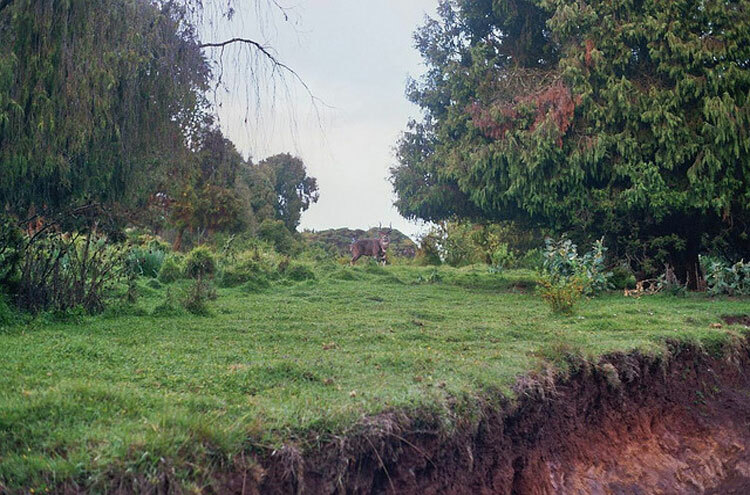 It is very well built in a spectacularly beautiful location and very comortable but it is very remote, 12 hours by road from Addis Addaba and with no operational local airport. We did some excellent walks from the Bale Mountain Lodge with very knowledgeable guides through the rain forest. The wild life is not as numerous as it is in East Africa and you have to work hard to find it. but it is rewarding when you do and there is no one else there. We saw many different birds, Bale monkeys and several magnificent Colobus monkeys. There was wonderful lush vegetation and old trees, many wild flowers, fine stands of Bamboo, but little big commercial timber. 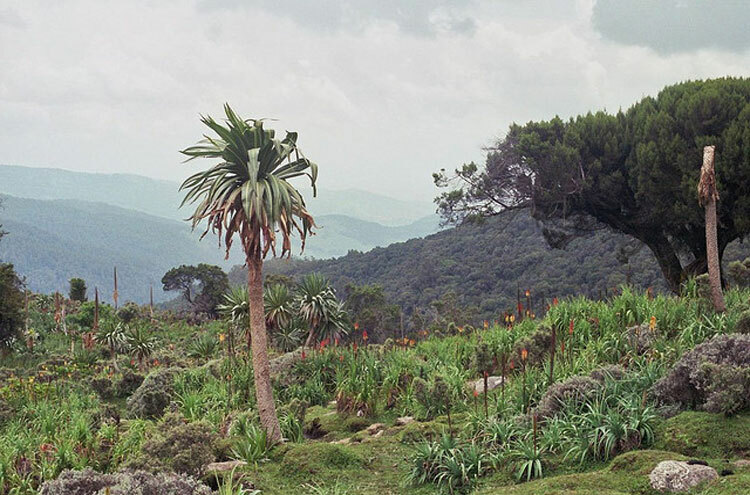 The Bale Mountain Park is enormous and it would take you three weeks or more to walk the distance we travelled.